Home Uncategorized CityDig: Greetings from Sunny Southern California! CityDig: Greetings from Sunny Southern California! As the country staggered toward the second decade of the depression, Los Angeles still thumped the tub for tourism in the “land of oranges and snow.” Despite all odds, the city continued to wring money out of the economy with their booster claims of Southern California as an unparalleled resort for those with a few bucks to spend. One of the small but effective ways word spread about beautiful Los Angeles was via penny postcards, often sent to residents of Keokuk or Bemidji or Fitzburg (all of whom were surely suffering through a fourth month of winter). While the above map may just be a humble painted postcard, it does stretch some colorful truths in service of selling the City of Angels to tourists. 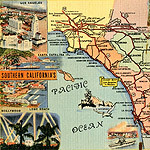 Today, the term “romantic” does not apply to many highways in the southland, but this postcard promises that “an hours drive takes one from the shores of the beautiful Pacific to the snow-capped peaks.” The romantic highways include the 101, so named in 1926, which was a joining of many roads heading North, including the El Camino Real that once connected the missions in Spanish colonial times. Highway 99 encompassed parts sometimes known as the Ridge Route and Grapevine, then eventually morphed into the Golden State highway and later became part of I-5. The famed Route 66 is shown here from Barstow to San Bernardino, through Upland to Pasadena, and on to Santa Monica. Highway 60 is also shown, which went out to Pomona and continues all the way to the Arizona state line (with a link to Palm Springs along the way). 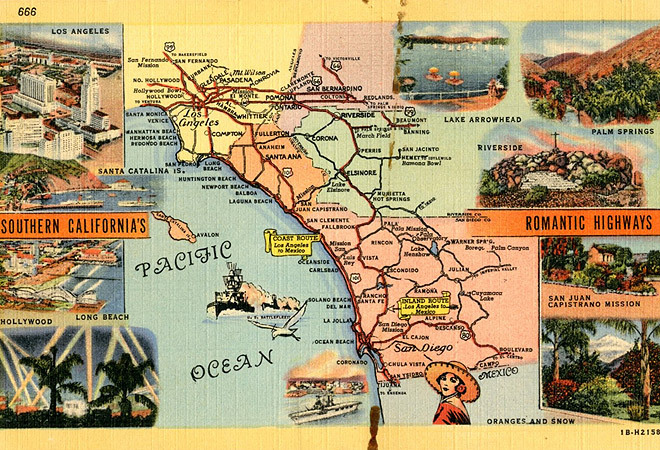 The locations are limited, but even so, the map points out some nice places to visit when visiting Southern California: Catalina and its swing dance hotspot Casino; the Long Beach pier and its two fine roller coasters; a sailboat dotted Lake Arrowhead; spotlights beaming from a glamorous premiere night in Hollywood; the Ramona Pageant in Riverside county; quaint San Juan Capistrano with the arrival of the swallows in March; and dear old Los Angeles portrayed near City Hall, with the Courthouses and Hall of Records gleaming white. The date of the map can only be guessed at, but going by the identification of the U.S. Battlefleet (the title was changed in 1941), the one cent postage, and the prominence of March field (where the Army Air corps trained), it points toward a pre-War L.A. that “is literally but a moment from thriving modern cities to sleeping haciendas of Spanish Rancheros.” Like watching the Rose Parade on New Year’s Day, the dazzle of sunny Southern California seen on postcards like this one brought many thousands of hopefuls out to our city.